How do I know if my furniture is worth recovering? Do you replace the foam in the cushions? How long does it take to get something recovered? Do you do anything with the wood trim on my furniture? Can you change the style of my piece? Do you do window treatments? 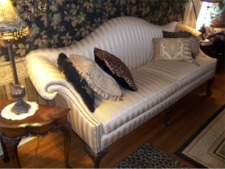 Do you clean upholstered furniture? Do I have to bring my furniture to you? Recovery Room Upholstery can tell you if you have such a frame. units for authenticity when recovering an antique. begin working on it. Once your project is picked up by us, you should see it back in your home in a couple of weeks. see samples of them in our showroom. springs, replacing rubber webbing straps. If it needs repairing, we can probably help. When your furniture goes through our process we clean the wood and oil it with a scratch covering furniture oil. In the case of teak wood, we use a teak oil recommended by top scandinavian furniture suppliers. is a substantial amount of refinishing, we send it out to a professional refinishing shop. to change the height of the back, or the shape of the arm. Call us with your ideas. your decor. Cornices can be straight along the bottom edge, or shaped to your taste. recommend. Please call Castle Cleaning Systems at 262-554-8040 for a quality cleaning job. than 15 miles from our shop, we do charge a fee for this service. Please call for information.